No doubt people have read the article from the Arizona Republic about Obama’s speech at the VFW national convention. Next, I’d like to address the folks who carry. I’m a strong advocate of carry, both concealed and open. I routinely open carry a pistol in public places, like the movie theater, grocery store, and so on. So far, I’ve had only positive interactions with people. Now, while one certainly has the right to carry in public in Arizona, this right also comes with responsibility and common sense. It should be common sense that openly carrying a firearm, particularly a rifle, near a function where the President of the United States is speaking will cause a fair bit of alarm and attract attention (almost certainly unwanted) from the public, the news media, the police, and the Secret Service (( You know, the guys on the roof with rifles who are interested in keeping their principal alive and unpunctured. )). 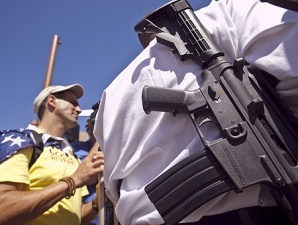 One certainly can openly carry firearms, including rifles, at such events, but it’s probably a bad idea. The best response one can reasonably hope for is being portrayed poorly in the media. Most likely, one’s actions will also reflect poorly on other gun owners. If one is particularly foolish, one might get arrested. At worst, one might get shot. Fortunately, the police in this situation recognized this individual as a person not presenting a credible threat and, while closely supervising him, let him go about his business. Major kudos to the police and Secret Service. I don’t think we’d see such a reasonable, measured reaction under Bush. I don’t fault anyone for wanting to carry a gun at public events — tensions have been growing high and there’s been a lot of strong words exchanged at such events. I’d just rather see people do so in such a manner that doesn’t call attention to the fact that one is armed (e.g. concealed), nor reflects poorly on other gun owners.